The Beer Check Gas Analyzer is an indispensible tool for brewers and draught service technicians. Determine the accuracy of gas blenders and premixed gas cylinders, or check for CO2 after purging air from kegs. 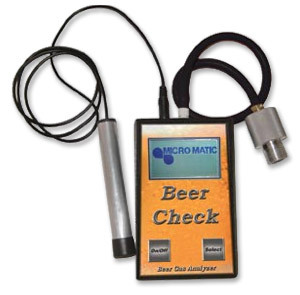 The Beer Check can also analyze the percentage of oxygen in nitrogen with an accuracy of +0.5%. While most electronic leak detectors can only sense specific gases such as CO2 or refrigerants, the Beer Check is able to sense any gas, capable of locating leaks down to 0.2 scfh (cubic feet per hour at standard conditions) or less. The Beer Check is powered by one standard 9-volt battery. Comes with adapter kit. This model also comes with a leak sensor wand that is used "listen" for leaks.